QUESTION: Should women wear earrings or note? What does the Bible say about this? ANSWER: I do not wear anything, including earrings, on my ears. I was too scared to have my ears pierced when I was a young woman and hated the ones that pinched. But when my daughter was twelve years old and begged to wear them they allowed it. Unfortunately, she developed a metal allergy and became quite infected from them. Now, as an adult, she only rarely wears earrings. I worked as a registered nurse in a Pediatrician's office for four years and saw some horrendous earring piercing on the bodies of some babies and young children. One little girl came in with a completely severed ear lobe because her little brother grabbed the hoops of the earrings and tore the tissue. Ear lobe tissue does not heal well because it lacks blood and nerve tissue. My personal experiences have kept me from enthusiastically endorsing the wearing of these things. The Bible DOES show that people did wear earrings (the Hebrew word nexem, Strong's Concordance Number #5141, means nose ring, earring or jewel), bracelets, jewels around the neck and other adornments. Does God approve of wedding rings? Trivia on famous Biblical wives! Should women only wear dresses? Isaiah the prophet, conveying God's words, states, "In that day the LORD will take away the beauty of ankle bracelets, and the headbands, and the crescents . . . The headdresses, and the leg ornaments . . . 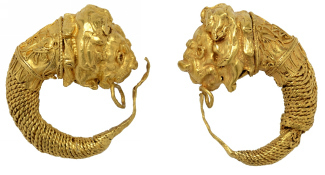 The rings (earrings) and nose jewels" (Isaiah 3:18 - 21, HBFV). from the 3rd century B.C. Interestingly, God himself stated he gave this jewelry as a gift! When God made a covenant with Israel he considered it like entering into a marriage covenant. After He "married" Israel he stated in the book of Ezekiel. Regardless of the expense or beauty of our earrings, jewels, clothes and alike, the apostle Peter reminds us what truly is the MOST important adornment that can be possessed. He encourages women when he states, "You should not use outward aids to make yourselves beautiful . . . Instead, your beauty should consist of your true inner self, the ageless beauty of a gentle and quiet spirit, which is of the greatest value in God's sight" (1Peter 3:3 - 4). In answer to your question, the Bible does not prohibit the wearing of earrings. However, for peace of mind, pray to God and ask him if he feels it is appropriate for you to wear this type of jewelry. What is the beauty of the Lord? The toughest women in Scripture! Precious gemstones in God's word!